An overflowing toilet can cause sewage to seep onto your bathroom floor. Your bathroom is one of the most functional rooms in your house, and if there is one thing that you need to count on, it is your toilet working and flushing properly. Unfortunately, life happens and sometimes toilets overflow. 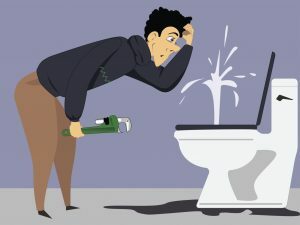 There are a few management techniques to use if your toilet is overflowing; to keep raw sewage from spilling onto your floor, keep reading on for tips on how to deal with an overflowing toilet. Your shut off valve is your best friend in the case of toilet overflowing. If the toilet overflows, the best action you can take is to stop the water flow at the source. To find your shut off valve, follow the pipe leading from your bathroom wall to the toilet, there should be a hand crank on the line. Closing the valve will put a stop to any water flow to your toilet and grant you a little time to clear the clog if the overflow is getting serious. To make sure your valve is easy to turn in a perilous situation, make sure you keep it clean and well lubricated so it doesn’t jam when it matters the most! In the event that you are unable to get to your shut off valve, your next plan of action is inside the tank. First you want to lift the lid on the back of the toilet and set it to the side. The part you want to check is the rubber part called the flapper located at the bottom of your tank. If the flapper is open, then reach in a close it on your own to stop the flow of water. In the event the flapper is closed and water is still flowing, look to see if your toilet has a float ball. A float ball is a component that floats on the surface on the water and its function is to make sure your water isn’t rising too high. Manually lift this, and your water may shut off. Clear the clog away by using a classic plunger. It’s recommended to get one with a toilet flange as your go-to. Sometimes plunging can help relieve an overflow by removing the clog, but remember, always clear a clog even if the toilet has stopped overflowing. Give Master Plumbing a call at 301-650-9100 or contact us online to get more information on how our expert plumbers can help you with your dripping faucet or just about anything else plumbing related! We have received Angie’s List Super Service Award recognition for plumbing and drain cleaning every year since 2007, in addition to the Best Plumber award from Best of Bethesda. We are full licensed, bonded and insured and our service is unparalleled. Give us a call today-you won’t regret it! To see examples of our projects, follow us on Facebook, Twitter, and Pinterest. This entry was posted on Friday, July 14th, 2017 at 3:49 pm. Both comments and pings are currently closed.